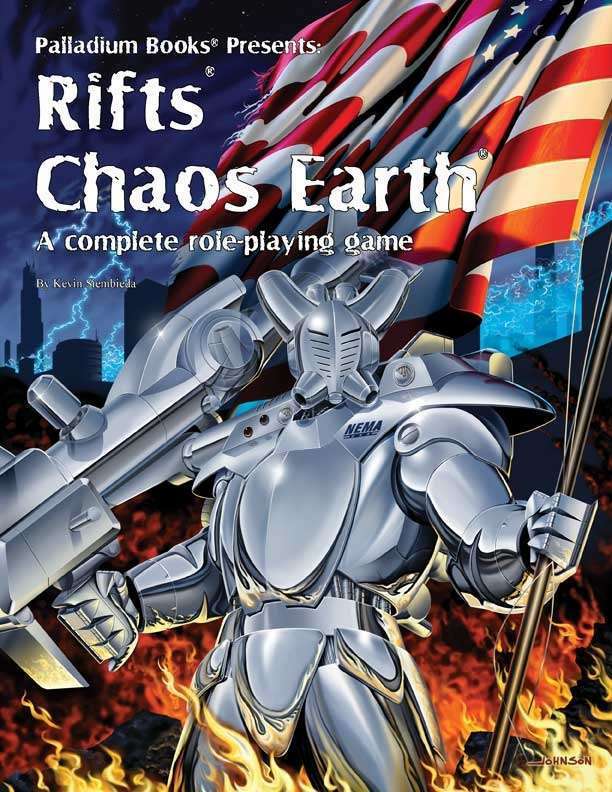 Chaos Earth® is a complete role-playing game with its own, unique, stand-alone setting. Player characters are heroes lost in the throes of the Apocalypse. Equipped with the most advanced robots, power armor and weapons in the world, they refuse to give up, and fight against overwhelming odds to save some fraction of humankind. Meanwhile, nightmarish creatures swarm to Earth through Rifts – tears in the very fabric of space and time – to torment and prey upon the survivors of the Great Cataclysm. Earth is quickly being transformed into an alien landscape, and the player characters are humankind’s last and best hope for survival. It is the end of the world as we know it and the dynamic prequel to the ever popular Rifts® RPG series. See how it all began and carve out your own place in Rifts® history. Overview and history of the Great Cataclysm. Introduction of NEMA – the heroes of the Northern Eagle Military Alliance who struggle to save lives and bring peace to chaos. 11 different character classes, including power armor and robot pilots, the Para-Arcane, Demon & Witch Hunter, Chromium Guardsman, Silver Eagle and more. Background setting, missions and adventure ideas by the dozen. 160 pages by Kevin Siembieda. For more information,on this or any other Rifts® title, please visit www.palladiumbooks.com.